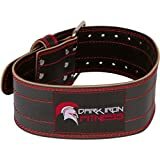 Choosing a weightlifting belt is an important decision, you don’t want to be one of those people who just run off to their nearest Walmart, find a belt they like the look of and head to the cash register. We need to pay some attention to whether the belt is the correct type belt for our lifting needs. If you like the idea of buying a Nike weight lifting belt then there are 3 excellent belts to choose from. In our detailed review we’ll take a look at Nike’s structured training belt and the men’s and women’s intensity lifting belts, if this is your first lifting belt make sure to read the whole article, not just the reviews as there’s some helpful info that will make choosing the right belt for you that little bit easier. One of the main reasons many of us look for a weightlifting belt is to protect our back during heavy, long lifting sessions, are you wondering which type of belt you should buy? However if you are only looking for a belt to help you lift weights and you’re injury free then read on. When we look for a weightlifting belt the most important factor we need to make sure of is if it fits. This isn’t usually a problem with velcro belts or any quick release systems because it’s fairly easy to adjust the belt each time for a custom fit. All 3 of the Nike Belts are Velcro, Velcro belts are available in different sizes so make sure you get one close to your size, all brands differ slightly. Single pronged and double-pronged belts ( usually leather) allow you to get the belt as tight as necessary, but in some cases your waist and the belt may not be in agreement, if there isn’t a hole right where you need to insert the prongs then the belt will either be too tight or too loose, it’s a good idea to try on this type of belt first to make sure it’s the exact fit you need. Most weightlifting belts are available in widths ranging from 2″ to 6″, there are a couple of 7.5″ out there, Harbinger firm fit lifting belt being one of them, but typically we’re looking at the 2″-6″ range, you’ll find most bodybuilding weight belts are wider at the back and narrower at the front. Normally a 4″ width at the back will provide enough versatility for both heavy squats and deadlifts. In some cases taller people may opt for wider back support, this really comes down to personal preference, I’ve trained with many tall guys who are perfectly happy with a 4″ support but if you’re particularly tall, a 6″ width at the back of the belt may suit you better. This is version 2 of Nike’s extremely popular structured training belt, a belt which has been designed to be ergonomically friendly and anatomically correct, what does this mean? It means this belt has been contoured to fit the hip and rib cage without restricting your movements, a design that allows for proper lifting technique even when lifting the heaviest of weights. A really useful feature of this belt are the plastic inserts in the back which are there to provide even more stability, so not only can you tighten this belt for support, you also have stiff plastic inserts which assist in keeping your back straight. The comfy design of this belt has allowed many people who have bought the belt to use it for other activities separate from weightlifting, Many owners have commented how the belt is useful for a ton of everyday activities…that’s versatility for you. 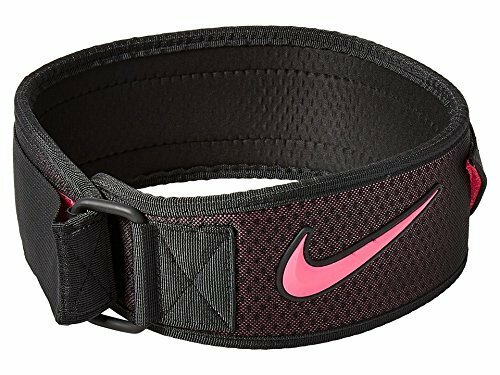 Nike’s belt is extremely breathable as well, you might have noticed from the picture this belt has a perforated back panel with ventilation channels, great for helping you stay cool and also helps to keep you from sweating around the weight belt. A great choice of weight lifting belt for someone who prefers a little bit of comfort when they are lifting, the velcro locking system is fast to take on and off and gives you the option to make micro adjustments, something you can not achieve from a leather belt, this is an excellent example of a synthetic lifting belt, one of the best on the market and for the price it’s worth every penny. 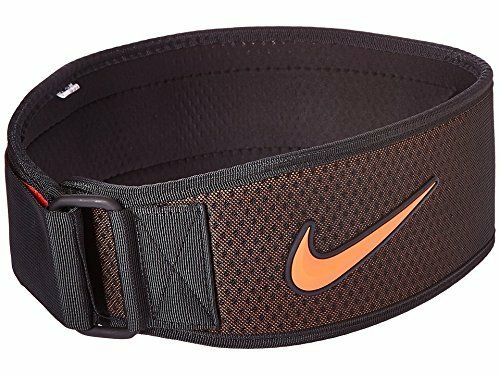 A natural fitting lightweight, lifting belt from Nike, this belt hasn’t been designed for serious lifters, but for occasional heavy lifting and general workouts, it will provide a decent amount of support. What is nice about synthetic belts like Nike’s intensity, is they will not restrict you in any way when you’re lifting, they are a much more natural feel than a leather belt, the lining is soft and comfortable providing you with maximum flexibility, this will also allow you to wear this belt for long periods of time when you’re working out. If you are after a weight lifting belt that’s been designed for CrossFit type workouts or general light lifting then this belt is a good option. It also makes for a great first belt for anyone who is just getting into lifting, it will help make the transition over to the heavier leather belts that much easier. The woman’s Nike intensity belt really isn’t much different to the guys, both are contoured lifting belts which help to support the core and just like the men’s belt it has not been designed for powerlifting, it’s been designed primarily for comfort and secondly for speed, whilst providing as much support as possible. You can take this belt on and off very quickly because of the hook and loop design of the velcro fastening system. Again similar to the guys’ belt the women’s Nike intensity is great for CrossFit type workouts. The lightweight EVA liner should provide enough hardness to give your back the support for most lifting exercises. If you are only into light lifting this is a great alternative to the more expensive heavy duty leather belts. All 3 of the Nike training belts are in essence, just that, training belts, they are not for heavy powerlifting movements or competitions, what they do provide is an option for weight lifters who prefer something a little less heavy duty than their leather counterparts. Their lightweight design and ease of use is why both the men’s and women’s Nike intensity belts have become very popular with CrossFit athletes. Zink, A. J., et al. The effect of a weight belt on trunk and leg muscle activity and joint kinematics during the squat exercise. J. Strength Cond. Res. 15:235-240, 2001. Bauer, J. A., et al. The use of lumbar-supporting weight belts while performing squats: Erector spinae electromyo-graphic activity. J. Strength Cond. Res. 13:384-388, 1999.